This series of eight workshops offers an opportunity to experience the profoundly centering and grounding influence of meditative chant through chants drawn from many traditions — Buddhist, Hindu, Aboriginal, Jewish, Christian, Sufi, Pagan, etc. As in all Barclay’s chanting classes, participants are encouraged to make chant out of their own day-to-day experience and share their chants with others. This well loved exploration of the centering and calming effect of chant drawn from a variety of traditions meets 7:30-9:00, in St Luke’s Church on Wednesday evenings (except the first Wednesday of the month which is reserved for Come Sing). Please contact Barclay for upcoming dates for this workshop. Fee for the series is $160. Happy new year! I just wanted to confirm, as per my expression of interest during the Celebration of Light, that I do indeed want to register for this next chanting session. I’ll bring along a cheque with me next week. I’m assuming there’s still space and that this won’t be a problem — just let me know if it is. Looking forward to seeing you next Wednesday! Hope you had a great trip to Nova Scotia over the holidays! good i will really like to have mantra meditation to me.so where can i get it and how? where to get the book or videos for mediation? Thanks a lot for the Info. 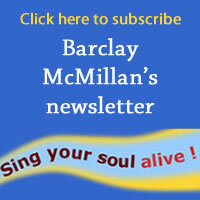 I’ve contacted the Ottawa voicework and voice workshops from Barclay McMillan and they’ve booked my session. Thanks a lot for sharing this. I really appreciate your kind efforts.